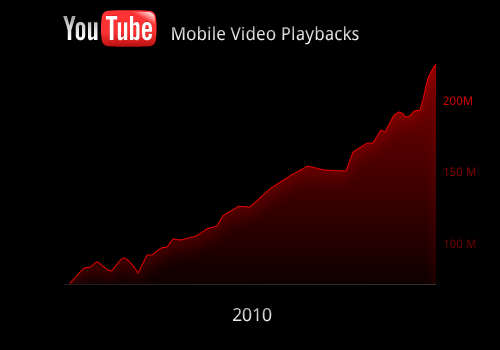 Youtube In 2010: 3X Rise In Mobile Traffic; 200M Daily Video Views! Youtube has released some pretty interesting stats about the traffic the website received from mobile devices. With all the Android, iOS and BB wars still going on, something which the mobile phone users did not leave behind is Youtube! The video social network clocked up to 200 million daily video views from mobile devices, taking the overall traffic to as high as three times just from mobile viewers. Apart from this, You tube has also started showing official music videos of famous artistes in association with VEVO, EMI, UMG & Sony. Also, YouTube is now now allowing its content partners to show 15 second pre-roll ads on videos played via YouTube’s Android application.